The “Learning Computer Literacy” summer school , successfully finalized its last day in Thumane. A total of 22 participants benefited from this project, in the age groups of 12-16 years old, from the secondary and high school “Ramazan Jangozi” Thumane and 18 participant, aged 11-16 years old from the secondary and high school “Haxhi Qira” Borizana. Participants are also beneficiaries of the “Family Strengthen Project” supported by ANTEA from 2015 and implemented by the SOS Village. 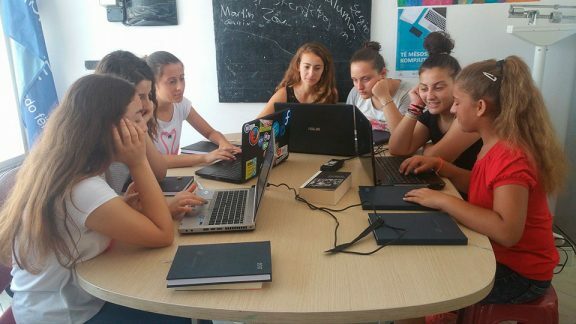 The “Learning Computer Literacy” summer school project was implemented thanks to the grateful support of ANTEA Cement by two youth and volunteers organizations such as Liburnetik and PVN Albania. This project is part of the Corporate Social Responsibility Action Plan of the company and took place in the premises of ANTEA’s office in Thumana. During this two months program, Liburnetik organization assured knowledge transfer to the participants regarding (i) Windows Operating Systems, (ii) Microsoft Office Package, (iii) History of Computers (iv), Main Functional Keyboard Commands and (v) Basic Hardware Architecture. Throughout the summer school, participants demonstrated an increasing interest in the topics due to a friendly environment, the distribution of creative materials and the participants’ self-interest in gaining knowledge on applying computer tools and skills. Therefore, the teaching method implemented by Liburnetik and PVN Albania has made this program more effective and easily understandable, by focusing on frontal lectures, individual assignments, group assignments, tutorials, creative videos etc. A knowledge-test were applied to understand the progress acquired by participants and to identify six of the winners of this two months summer school. The summer school finalized its session with the award of three of the most active participants of Thumana who had demonstrated outstanding learning progress, by awarding to the first place winner, a new notebook computer (laptop), to the second and third place winners a book and a pen drive (usb). The same method applied for pupils from Borizana by awarding to the first place winner a bicycle, to the second and third place winners a book and a pen drive (usb). ANTEA distributed these donations to the local community children in view of making its CSR impact more sustainable by motivating the participants for their future ambitions.